Over the last few years, I’ve met several people who SWEAR by fresh pumpkin. They tell me I should never use canned pumpkin because you can really tell the difference between fresh roasted pumpkin and canned pumpkin. Well, this year, I decided to test it out. First, I used a “pie pumpkin”. This is a much smaller pumpkin. Prior to roasting it, I used it as a table centerpiece. I have heard mixed responses in person and online as to whether you have to use a pie pumpkin or can just use a regular jack-o-latern pumpkin. From my experiences with my baked pumpkin dinner, I think you’d be safer using a pie pumpkin. Jack-o-lantern pumpkins sometimes have smooth, creamy interiors and sometimes are more stringy like a spaghetti squash. You wouldn’t want the stringy texture. 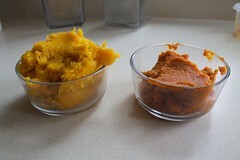 Here is a comparison of the purees. I roasted my pie pumpkin at 400 for about 45 minutes-1 hour, until it was fork tender. (I cut it in half and seeded it first). Fresh is on the right, canned on the left. You can see the canned is a much deeper orange color. And a slightly more watery, smoother texture. I could have added some water to mine to puree it to a similar consistency. I didn’t think it was necessary. 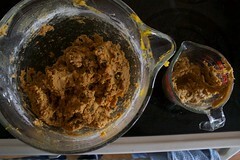 Here is the cookie dough. This is flipped from above – canned on the right, fresh on the left. This one is harder to tell a difference. The dough is a bit darker with the canned, but not too much. The doughs mixed up and baked pretty much the same. And of course, the final product. Back to fresh on the right, canned on the left. Any difference you see is in the lighting. There was not visible difference in the two cookies. Taste? Well, I tried out both cookies on 18 people, not telling them what the difference was, asking if they had a preference. Most said they really couldn’t taste much of a difference. If they HAD to choose, maybe they liked canned better (although they didn’t know it was the canned one). So my verdict: I’ll be buying canned pumpkin. To me, there wasn’t a big enough difference to justify the work and money of making my own. But I’d love to hear your thoughts and experiences in the comments.